Neuroimmunol Neuroinflammation 2017;4:238-42.10.20517/2347-8659.2017.16© The Author(s) 2017. 1Department of Pathology, Huashan Hospital, Shanghai Medical College, Fudan University, Shanghai 200040, China. 2Department of Neurosurgery, Huashan Hospital, Shanghai Medical College, Fudan University, Shanghai 200040, China. 3Department of Neurosurgery, The Third People’s Hospital of Shijiazhuang, Shijiazhuang 050011, Hebei, China. 4Department of Critical Medicine, Huashan Hospital, Shanghai Medical College, Fudan University, Shanghai 200040, China. *Authors contributed equally to this manuscript. Human sparganosis is a rare disease often affecting muscle, subcutaneous tissue and other locations, but sparganosis invading the brain is rather rare. Cerebral sparganosis has no specific symptoms which makes the diagnosis quite difficult and is usually neglected in the clinic. Here the authors reported a case of a 29-year-old female who was diagnosed with cerebral sparganosis and underwent surgery in their department and a brief review of the literature was conducted as well. Human sparganosis is a rare but increasing emerging food borne zoonosis caused by the plerocercoid larvae. The genus spirometra constitutes several species including S mansonoides, one of the most commonly reported human sparganosis infections in Asia. The lifecycle of spirometra starts with adult worms living in the intestines of dogs and cats and eggs shed in faeces in the environment, while frogs and snakes usually serve as second intermediate hosts. Humans are mainly infected through drinking untreated water containing spirometra larvae, consumption of undercooked frog or snake meat, or using raw flesh on open wounds as traditional poultices[3-7]. Sporadic human sparganosis has been documented worldwide, but the prevalence is higher in Asia countries, especially in China, Thailand, Japan and South Korea[3,5,8,9]. The most common target places in humans for spirometra are subcutaneous tissue or muscle, cerebral sparganosis is relatively rare but represents the most severe type, characterized by symptoms like seizures and the wandering sign in magnetic resonance imaging (MRI) scanning. Management of cerebral sparganosis includes surgical removal of the worm as well as postoperative anti-parasite medication. However, cerebral sparganosis cases can be cured with medication alone. Cerebral sparganosis has a good prognosis after treatment. Here, we report a case of a cerebral S mansonoides infection and provide a brief review of the literature. A 29-year-old female patient was admitted to the department of Neurosurgery due to intermittent right upper limb epilepsy and a left parietal lobe lesion. The patient experienced her first seizure attack half a year ago consisting of involuntary movements in the right upper limb. She did not take it seriously and did not take any anti-epileptic drugs (AED) medications. Two months before admission to the hospital, seizures became more severe and she found a migratory nodule under her skin on her right thigh. She had lived in Fujian Province her whole life and enjoyed eating frogs in local restaurants. The people in Fujian Province have a habit of eating frogs, crabs, snake, chicken and pig meat, which are all host animals of the sparganosis. Computed tomography (CT) showed a left parietal lesion with large adjacent edema and the MRI showed an irregular hypointense lesion in T1 weighted imaging (T1WI) and hyperintense signal in T2 weighted imaging (T2WI). The lesion was homogenously enhanced in T1WI and with largeperi-lesion edema. MR perfusion showed increased blood flow in the lesion area while spectroscopy showed an increased peak of choline (Cho) and decreased peak of N-acetyl-aspartate (NAA) [Figure 1]. A cerebral parasitic infection was suspected since the patient was from the endemic area with a previous history of eating undercooked frogs. Blood and cerebrospinal fluid (CSF) samples were sent to the China Institute of Parasite Research for detection, the antibody for S mansonoides was positive in blood sample but negative in CSF sample. Another lumbar puncture was conducted and this time the antibody for S mansonoide was positive in CSF sample. A craniotomy was performed to resect the lesion. A right parietal under-navigation craniotomy was performed. A white long living parasite was seen and extracted. Postoperative pathology confirmed the diagnosis of S mansonoides. The patient received anti-parasite medication after the surgery, postoperative MRI showed complete resection of the lesion. The patient had no seizures after 6-month follow-up [Figure 2]. To investigate the epidemic and clinical characteristics of cerebral sparganosis. We searched Pubmed using the keywords “cerebral sparganosis” and “cerebral sparganosis mansonoide”. English literatures with at least abstract available were reviewed. Human sparganosis usually occurs when patients consume undercooked frog or snake meat, drink unboiled water contaminated by procercoidlarve. In some rural areas, people use fresh snake or frog meat directly on open wounds as a cure method. Sparganosis can be transmitted through this way, too. Cases of human sparganosis are mostly reported in east Asia, especially in China, South Korea, Thailand and Japan. Till now, only three cerebral sparganosis cases were reported in Europe[9,17]. Sparganosis can migrate to various tissues and organs, such as subcutaneous connective tissue, muscle, breast, lungs and the central nervous system. Reported cerebral sparganosis cases are quite small compared to other site sparganosis, but according to Hong et al. the prevalence of cerebral sparganosis was underestimated, many cases were not reported. In addition, a lot of Asian patients were reported with local language rather than English. The incidence of cerebral sparganosis of children and young people are higher than adults, and people in rural counties who are in underprivileged financial status have a great opportunity to get a sparganosis infection due to hygiene problems. Cerebral sparganosis can cause various symptoms including headache, seizure, parenthesis, confusion, memory loss, etc. The symptoms are related to the location of the lesion, the most common symptoms were various types of seizures. In some cases, it can even present as an intracranial hemorrhage. Fever is not a common symptom. Lesions are mainly located at frontal-partial lobes but invasion to cerebellums are also reported in very few cases. Diagnosis of cerebral sparganosis is relatively hard since it has no specific manifestations. A history of traveling or living in endemic areas may indicate a possibility for the diagnosis. In China, the majority infected people had a history of consuming undercooked frog or snake meat. Besides histories of traveling or living in endemic areas, an active infection of other organs is also a useful clue for the diagnosis of cerebral sparganosis. In our case, the patient had a migratory nodule on the right upper limb, which makes us highly suspect a diagnosis of cerebral sparganosis. Blood can show an increase of eosinophilia. The disease can also be diagnosed with antigen specified IgG antibodies from blood and CSF samples, although cross-reactivity with other infestations or clonorchiasis limititsspecificity[13,18]. In our case, the first CSF sample was negative for immune-reactivity but positive for blood sample, however, the second blood and CSF sample were both positive. CT scans usually show a mixed density lesion with peri-lesion edema, punctate calcification is shown in approximately 50% of patients[15,20]. The MRI of cerebral sparganosis is difficult to identify from low grade glioma or other tumors. Typically, ring-like or string-knot enhancement in T1WI images shows the sign of sparganosis movement in the brain parenchyma. Other characteristic features include a tunnel-shape configuration due to immigration of sparganosis through the brain parenchyma. Moreover, serial imaging may demonstrate the tunnel sign from a small nodular lesion and reflect the sparganosis activity in the brain[21-23]. MR spectroscopy of cerebral sparganosis (Bo and Xuejian and Chiu et al.) showed increased Cho and decreased NAA peaks in their cases, as in our case. Chiu et al. also revealed peaks at 1.3 ppm and a peak between 14 and 1.8 ppm in his 46-year-old female patient, however, our case did not show a similar result. MR perfusion did not show higher cerebral perfusion in our case that was seen in the case of Chiu et al.. Although some studies report that using anti-sparganosis drugs can successfully cure the disease, the most efficient way to cure the disease still is surgical removal of the sparganosis from the infested site of the brain. Both stereotactic aspiration and an opening craniotomy were used by neurosurgeons. The goal of surgery is to completely remove the granuloma along with the larval. Deng et al. reported a series of 11 cases who underwent stereotactic aspiration surgeries, complete removal as achieved in 10 patients while incomplete removal in 1 patient. Due to the small wounds, stereotactic aspiration is recommended by most neurosurgeons. In the 26 cerebral sparganosis cases of Hong et al., 16 of them were treated with craniotomy, 7 of them were treated with stereotactic aspiration and another 3 were treated with praziquantel only. None of them experienced a relapse of the disease. Yu et al. reported in 8 of 9 cases of cerebral sparganosis patients underwent a craniotomy due to lack of stereotactic equipment, with 1 patient dying due to unspecified reason. Both investigators reported that symptom duration more than one year indicated worse prognosisafter surgery[13,18]. In our case, we used a navigation guided craniotomy to resect the granuloma as well as the peri-lesion glia proliferation zone. The symptoms resolved immediately after surgery, the patient was administrated AED medication and 5 mg/day of praziquantel for 3 months. After 6-month follow-up, the patient was well without further seizures. Cerebral sparganosis is a neglected food borne zoonosis and since it has no specific clinical characteristic, it is usually misdiagnosed until postoperative pathological finding. Patients who had a history of consuming undercooked meat or from endemic areas should be highly suspected. Immunosorbent assay for sparganosis antibody using blood and CSF samples as well as MRI images can provide evidence for preoperative diagnosis. Surgery should be performed and postoperative anti sparganosis drugs should be administrated. Usually, cerebral sparganosis had a satisfying outcome based on surgery and drugs. We thank Dr. Yin Wang for his professional help in the field of neuro-pathology. This study was supported by grants from the National Natural Science Foundation of China (81372707 to Y. Gong) and the Science and Technology Commission of Shanghai Municipality (16140903000 to Y. Gong and 15140902200 to H.L. Tang). Informed consent was obtained from the patient included in the study (KY-2012-019). All procedures performed in studies involving human participants were in accordance with the ethical standards of Huashan Hospital, Fudan University and with the 1964 Helsinki declaration and its later amendments or comparable ethical standards. 1. Miyadera H, Kokaze A, Kuramochi T, Kita K, Machinami R, Noya O, Alarcon de Noya B, Okamoto M, Kojima S. Phylogenetic identification of Sparganum proliferum as a pseudophyllidean cestode by the sequence analyses on mitochondrial COI and nuclear sdhB genes. Parasitol Int 2001;50:93-104. 2. Liu Q, Li MW, Wang ZD, Zhao GH, Zhu XQ. Human sparganosis, a neglected food borne zoonosis. Lancet Infect Dis 2015;15:1226-35. 3. Anantaphruti MT, Nawa Y, Vanvanitchai Y. Human sparganosis in Thailand: an overview. Acta Trop 2011;118:171-6. 4. Gong C, Liao W, Chineah A, Wang X, Hou BL. Cerebral sparganosis in children: epidemiological, clinical and MR imaging characteristics. BMC Pediatr 2012;12:155. 5. Li MW, Song HQ, Li C, Lin HY, Xie WT, Lin RQ, Zhu XQ. Sparganosis in mainland China. Int J Infect Dis 2011;15:e154-6. 6. Sabu L, Lakshmanan B, Devada K, Sundaresh Kumar P. Occurrence of human sparganosis in Kerala. J Parasit Dis 2015;39:777-9. 8. Choi SC, Lee SY, Song HO, Ryu JS, Ahn MH. Parasitic infections based on 320 clinical samples submitted to Hanyang University, Korea (2004-2011). Korean J Parasitol 2014;52:215-20. 9. Lo Presti A, Aguirre DT, De Andres P, Daoud L, Fortes J, Muniz J. Cerebral sparganosis: case report and review of the European cases. Acta Neurochir (Wien) 2015;157:1339-43; discussion 1343. 10. Lv S, Zhang Y, Steinmann P, Zhou XN, Utzinger J. Helminth infections of the central nervous system occurring in Southeast Asia and the Far East. Adv Parasitol 2010;72:351-408. 11. Rengarajan S, Nanjegowda N, Bhat D, Mahadevan A, Sampath S, Krishna S. Cerebral sparganosis: a diagnostic challenge. Br J Neurosurg 2008;22:784-6. 12. Shirakawa K, Yamasaki H, Ito A, Miyajima H. Cerebral sparganosis: the wandering lesion. Neurology 2010;74:180. 13. Yu Y, Shen J, Yuan Z, Xia Z, Gao F, Jiang L, Jiang K. Cerebral sparganosis in children: epidemiologic and radiologic characteristics and treatment outcomes: a report of 9 cases. World Neurosurg 2016;89:153-8. 14. Kim DG, Paek SH, Chang KH, Wang KC, Jung HW, Kim HJ, Chi JG, Choi KS, Han DH. Cerebral sparganosis: clinical manifestations, treatment, and outcome. J Neurosurg 1996;85:1066-71. 15. Chang KH, Chi JG, Cho SY, Han MH, Han DH, Han MC. Cerebral sparganosis: analysis of 34 cases with emphasis on CT features. Neuroradiology 1992;34:1-8. 16. Yamashita K, Akimura T, Kawano K, Wakuta Y, Aoki H, Gondou T. Cerebral sparganosis mansoni. Report of two cases. Surg Neurol 1990;33:28-34. 17. Pampiglione S, Fioravanti ML, Rivasi F. Human sparganosis in Italy. Case report and review of the European cases. APMIS 2003;111:349-54. 18. Hong D, Xie H, Zhu M, Wan H, Xu R, Wu Y. Cerebral sparganosis in mainland Chinese patients. J Clin Neurosci 2013;20:1514-9. 19. Jeong SC, Bae JC, Hwang SH, Kim HC, Lee BC. Cerebral sparganosis with intracerebral hemorrhage: a case report. Neurology 1998;50:503-6. 20. Chang KH, Cho SY, Chi JG, Kim WS, Han MC, Kim CW, Myung H, Choi KS. Cerebral sparganosis: CT characteristics. Radiology 1987;165:505-10. 21. Chu S, Lu X, Wang Y, Gao G, Xv F, Zee CS, Yao Z. 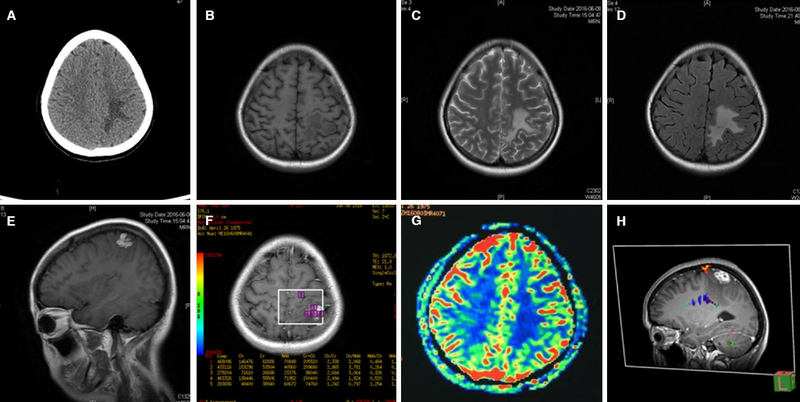 Magnetic resonance imaging features of pathologically proven cerebral sparganosis. J Int Med Res 2013;41:867-77. 23. Li YX, Ramsahye H, Yin B, Zhang J, Geng DY, Zee CS. Migration: a notable feature of cerebral sparganosis on follow-up MR imaging. AJNR Am J Neuroradiol 2013;34:327-33. 24. 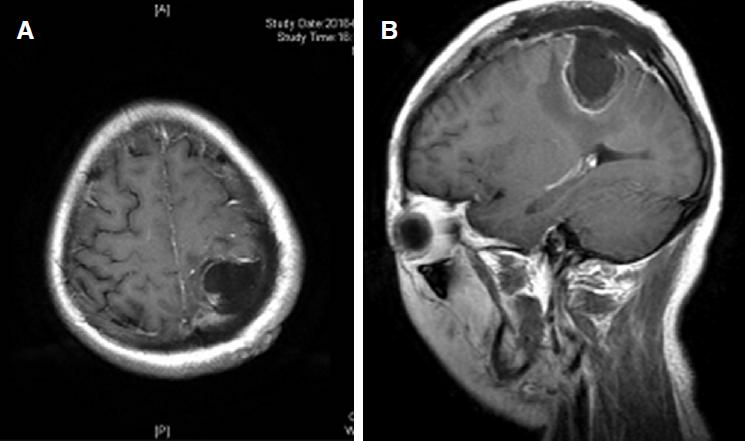 Bo G, Xuejian W. Neuroimaging and pathological findings in a child with cerebral sparganosis. Case report. J Neurosurg 2006;105:470-2. 25. Chiu CH, Chiou TL, Hsu YH, Yen PS. MR spectroscopy and MR perfusion character of cerebral sparganosis: a case report. Br J Radiol 2010;83:e31-4. 26. Deng L, Xiong P, Qian S. Diagnosis and stereotactic aspiration treatment of cerebral sparganosis: summary of 11 cases. J Neurosurg 2011;114:1421-5.